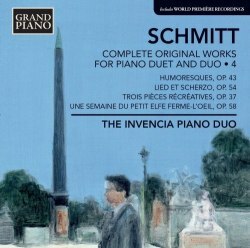 In my review of Volume 3 I wrote: ‘Such is the unfailing engagement and artistry of this music and these musicians that I can’t wait to hear the other discs in the series.’ And, lo, here comes Volume 4, with another selection of intriguingly titled bon-bons from this supremely talented twosome. Perhaps that’s a rather misleading description, for as appetising as these little pieces are they’re actually quite low in sugar. Indeed, it’s that very lack of sweetness that makes them so easy to consume in a single sitting. Schmitt’s teasing harmonies - resolution is just beyond one’s reach - keep one listening too. From the crystalline, strutting rhythms of the military march and the sudden spatter of dissonance in the rondeau to the inward little waltz tune and good-natured gotesquerie the Humoresques show Schmitt at his economical and evocative best. Happily there’s no grandstanding from the players, who treat these miniatures with the grace and affection they deserve. Rhythms are supple, dynamics are beautifully shaded and it’s all inked in the subtlest shades. The excellent recording - full and clear, if a little dry - is an added bonus. Lied et scherzo, originally written for double wind quintet, is remarkable for its ‘solo’ passages set against discreet utterances from the ‘orchestra’ as it were. It makes for a perky little dialogue, a strong sense of argument and counter-argument, which is always genial. It’s certainly not loquacious - that’s not Schmitt’s way - and this eleven-minute tête à tête seems to pass in a flash. In the Trois pièces récréatives, recorded here for the first time, rhythms are well sprung and the latent energy of this march and two dances is well controlled without stunting their shape and character. Indeed, there’s a poise and equilibrium to this music and music-making that’s a joy to hear. If Schmitt seems a tad restrained at times - cerebral, even - then the wit and whimsy of Une semaine du petit elfe Ferme-l'oeil (A Week in the Life of the Little Elf Shut-eye) will dispel such thoughts. These elfin tales, which morph into the child Hialmar’s dreams, bubble and effervesce in the most magical way; from the sparkle of La noce des souris (The Nuptials of the Mice) to the eyelid-drooping portrait of Le cigogne lasse (The Weary Stork) and beyond this music shows a level of invention that’s most impressive. Remarkably, the piece seems to combine the simple charm of Debussy’s kindergarten tunes with the adult quirkiness of Satie - and it does so in the most natural and seamless way. The stork may be a-weary but there’s absolutely no sign of lassitude in Kasparov and Lutsyshyn’s playing, which is always alert to small changes of mood and manner. As with the very best duos these musicians sound as one. Just sample the lilting circularity of La ronde des lettres boiteuses (The Round of the Lame Letters), in which their unanimity of purpose and execution is just astonishing. And for the most subtle of dynamic shifts La promenade a travers le tableau (The Walk through the Painting) is hard to beat. As for the particoloured writing of the umbrella-turned-Chinese-bowl - Le parapluie chinois - it’s superbly rendered by this duo, whose bursts of brio are always judiciously phrased and scaled. Collectors who already have the first three instalments in the series should not hesitate to acquire this one, and those who have faltered thus far should waste no time and follow suit. There is much pleasure to be found here, not least in this engaging and characterful playing. Decent liner-notes and a fine recording add to the irresistible charm of this release. Music of quality, stylishly played; surprisingly moreish, too. See also review by Byzantion.